The Collision Industry Conference returns Thursday in Palm Springs, and those who couldn’t make it out for the event can follow along in real-time with Repairer Driven News. Starting at 8 a.m. Pacific on Thursday, check out our live-tweet feed below. Join the conversation with #cicpalmsprings, and follow us on Twitter with @repairerdriven. 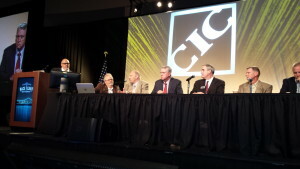 John Bosin of the Parts and Materials Committee will host a panel at 11 a.m. with electronic parts procurement vendors, a topic CIC’s been trying to tackle given potential inefficiencies in the “call and fax” method. At 2:30 p.m., the hot topic of redefining a “Class A” shop will likely return as Ron Guilliams and Chris Evans of the Definitions Committee discuss “Classifying Auto Body Shop competencies in a sensible way,” according to the agenda.Take the CIC’s survey ahead of the talk and read more coverage with our link here. At 3:30 p.m., another earlier CIC hot topic might be raised — the ominous statistics related to industrywide training and education (see some data from I-CAR here) as Gene Lopez and Bob Keith of the Education and Training Committee take the stage.